We’re in the throes of post-modern design obsession, so it’s not a big surprise to see this 1963 classic Polyside school chair designed by Robin Day making a comeback. 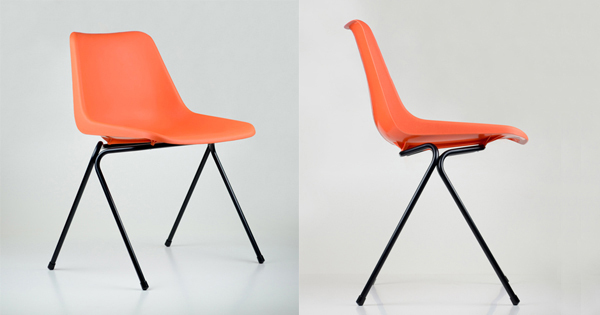 UK department store John Lewis has partnered with furniture manufacturer Hills to relaunch this iconic injection-moulded chair. If you’re not familiar with it, Day’s Polyside chair has a plastic seat with rolled edges set on top of a bent metal rod frame. It was ubiquitous in schools around the world, and if you were in school in the 80s or earlier, you probably spent a lot of hours sitting in it. I remember these chairs well: the way you could teeter precariously on the back two legs for a whole class if you got the balance just right, or the challenge to see how many chairs high you could stack them before the whole thing toppled. The ressurrected version includes the original stacking frame which was removed from the design in the 1980s. True to its roots, the chair comes in the original colours: light grey, charcoal and orange. In its time, the chair cost a mere 63 shillings, proving that good design and affordability can indeed co-exist. The updated price of £49 isn’t quite as affordable, but if the Polyside chair reappears in schools, it’ll be nice to see something familiar in our kids’ classrooms.